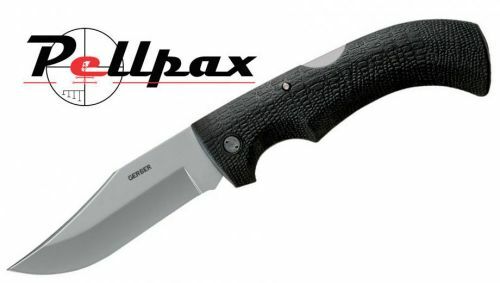 Home » Blades » Knives » Folding Knives » Gerber Gator Clip Point Knife 3.9"
The Gator Clip Point from Gerber features a 4 inch blade from high carbon stainless steel to ensure the finest cutting edge that lasts and lasts. Available in either straight edge or straight edge - serrated combo, the gator is an incredibly versatile knife that no camper, fisherman or outdoor survivalist should be without. The handle of this knife is designed to resemble alligator skin for a stylish finish as well as enhanced grip giving you the confidence to use this knife effectively at all times. Comes complete with ballistic nylon sheath. Gerber Gator Clip Point Knife 3.9"